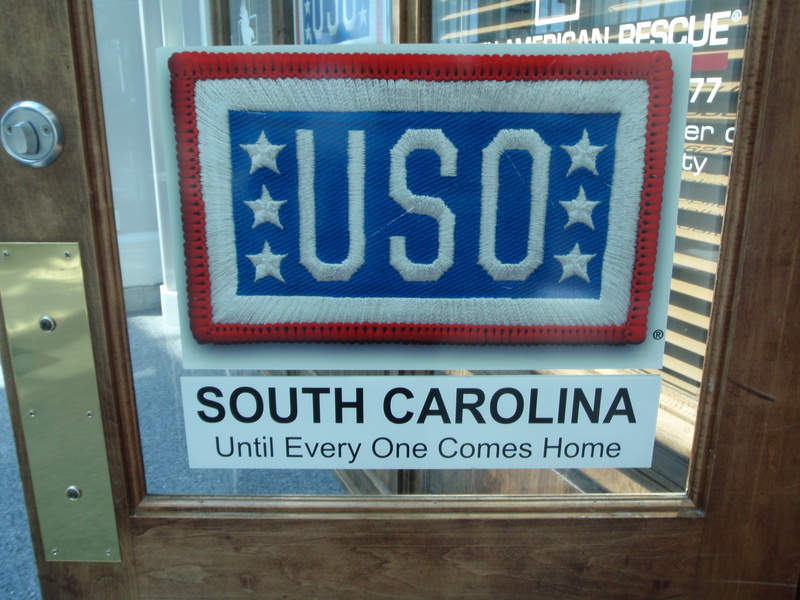 I stayed near Columbia last night because I had read that South Carolina’s USO is located in the Columbia airport, and since they’re usually open on weekends, I figured it would be a good place for my Sunday donation. So I drove to the airport, expecting a big bustling one since Columbia is the capital of the state. 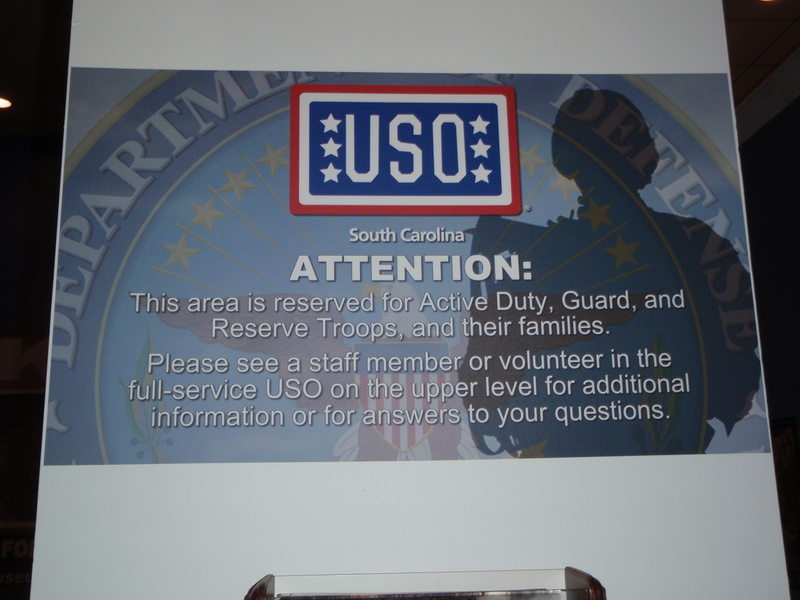 But it was actually very quiet, although when I drove around I didn’t see any signs at all about a USO. I drove around by both the departure and arrival areas, and began to wonder if I had mis-read something. So on the next pass, I saw a lady who seemed to be monitoring some curb-side parking, and I asked her about it. 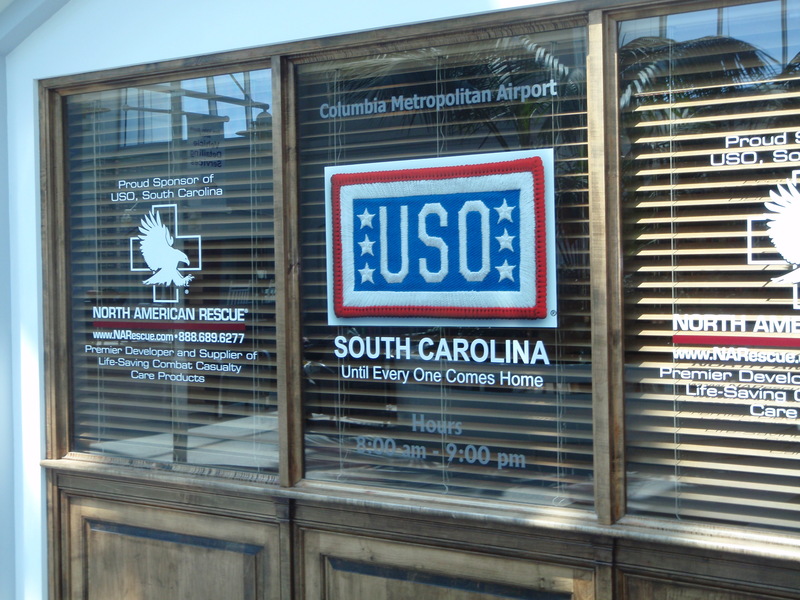 She not only told me the USO was indeed right inside the door, but she let me park in a place people can’t usually park since I was making a donation. I went in and met the volunteer who was working (she drives down from Charlotte, NC to volunteer!) and it’s a very nice place. 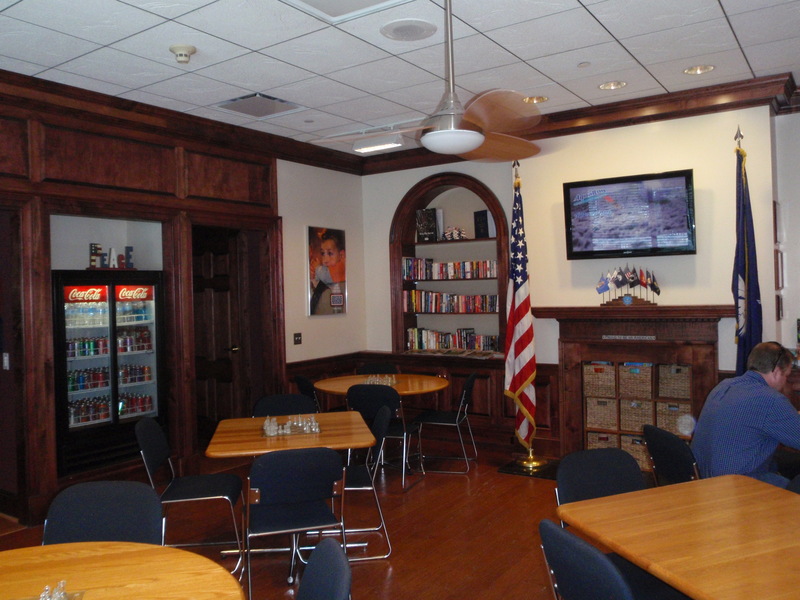 It’s all wood-paneled (courtesy of Lowe’s) and is a very inviting place for all the military troops who come through. The volunteer also took me downstairs to the “overflow” room – sometimes they are very crowded. 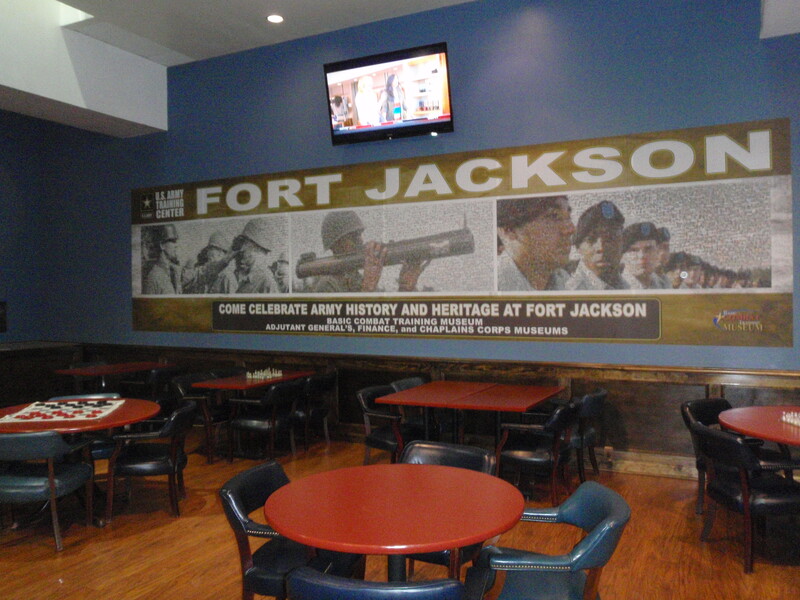 There was only one person in the place this morning, but the airport is close to Fort Jackson, which is one of the biggest army training areas in the country, and every summer the USO experiences “summer surge” when 9,000 new recruits come through to begin basic training. The volunteer said it’s pretty exciting when the place is bustling with new recruits! So it was fun to see all of that, and my donation will help get supplies for the summer surge. 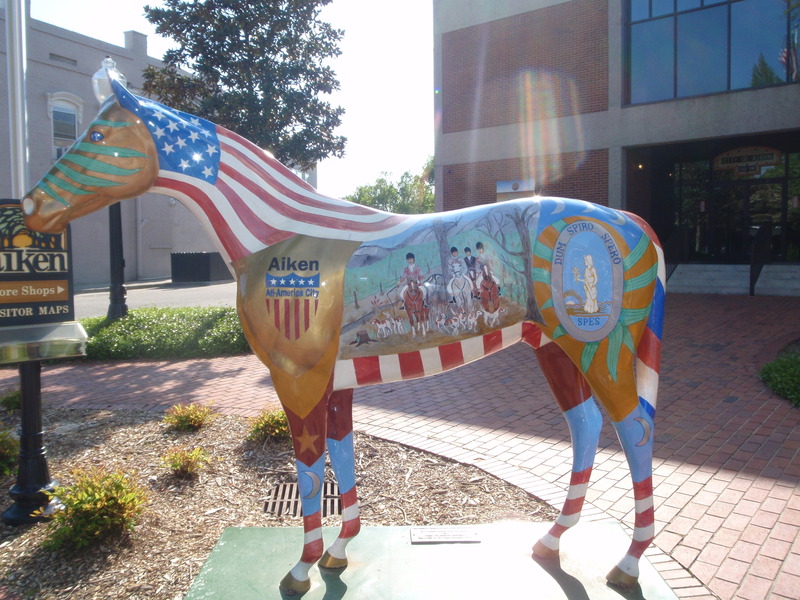 Then I headed down to Aiken, which is in South Carolina’s horse country. But we stopped along the way in a little town to get a couple miles of walking in. 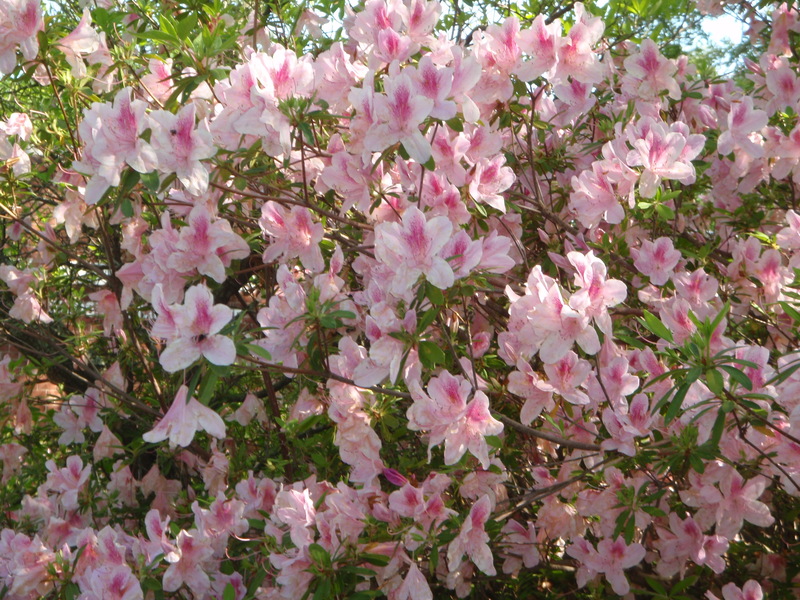 I had stopped in Aiken in 2011 when South Carolina was my annual “state-of-the-year” trip, and I knew I wanted to come back and walk some more here. 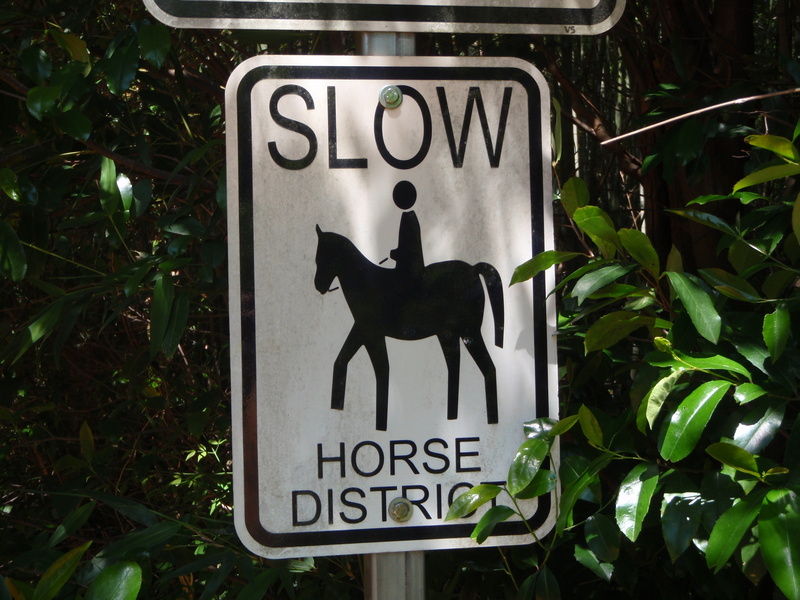 The horsey part of town is truly a horse paradise. 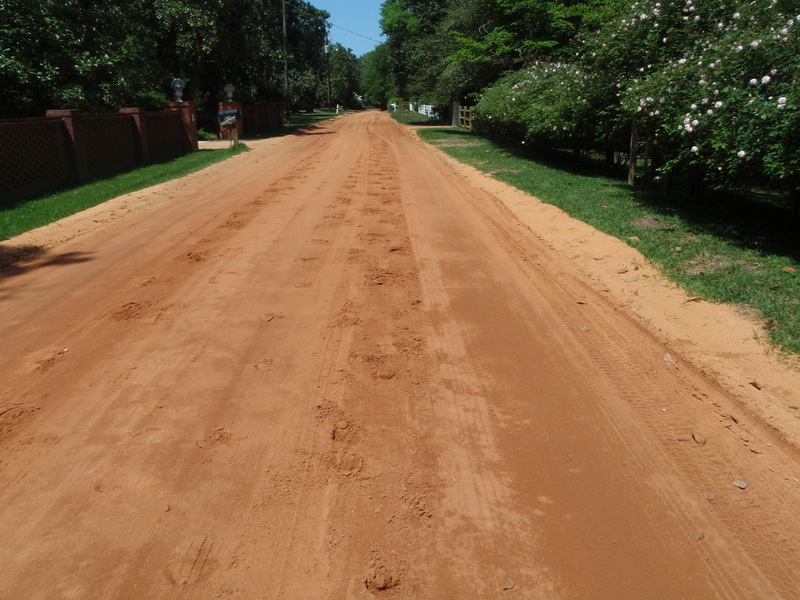 The roads are soft red dirt for riding (almost completely shaded by big trees) and there are countless horse barns, 2 polo fields, and a jumping arena. 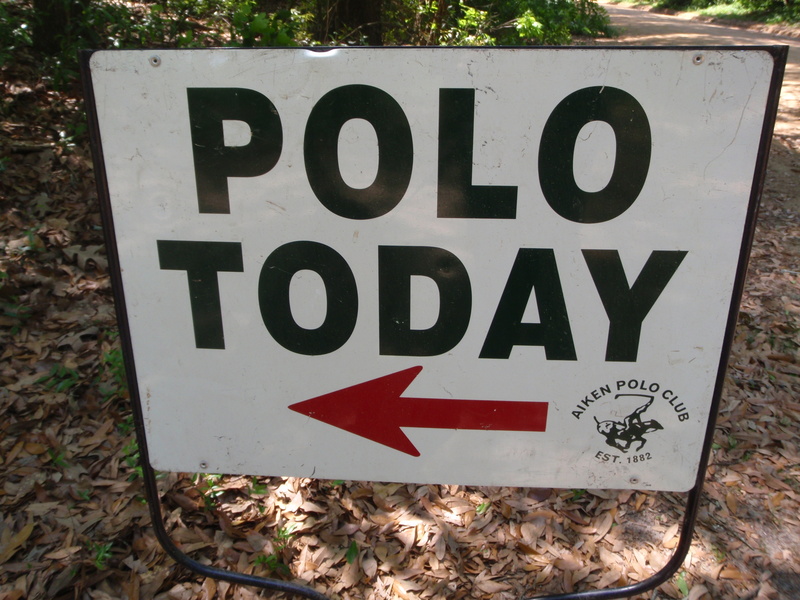 One of the polo fields had a sign out that there would be a polo match at 3:00 this afternoon. I found a place to park and Tula and I did some more walking on the red dirt roads until it was time for the polo match, which I wanted to watch. 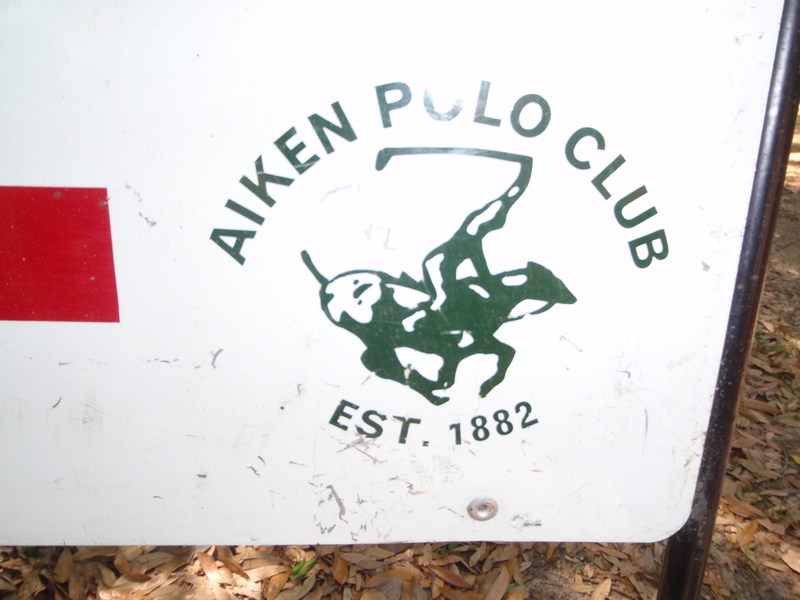 I found another cool shady place to park, and went in to see what polo was all about. 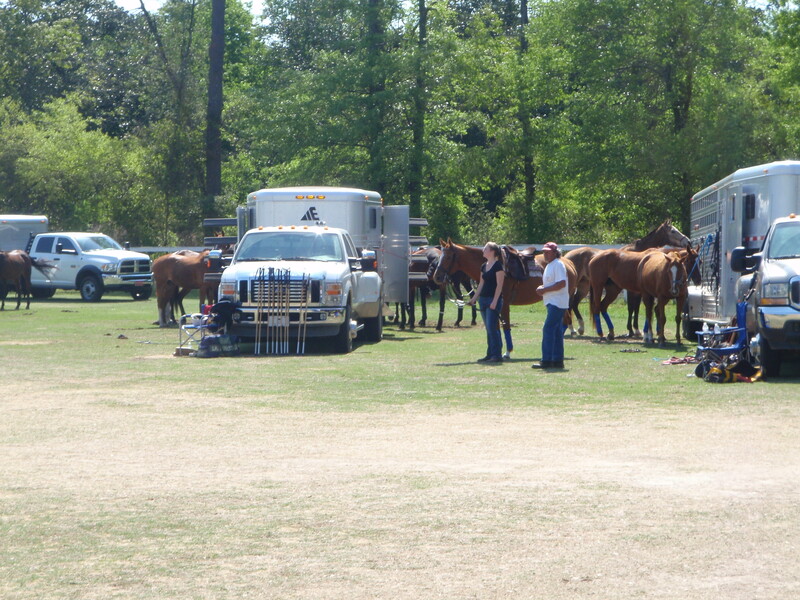 Many attendees are regulars and they reserve places to park right along the polo field, and they back in and tailgate. 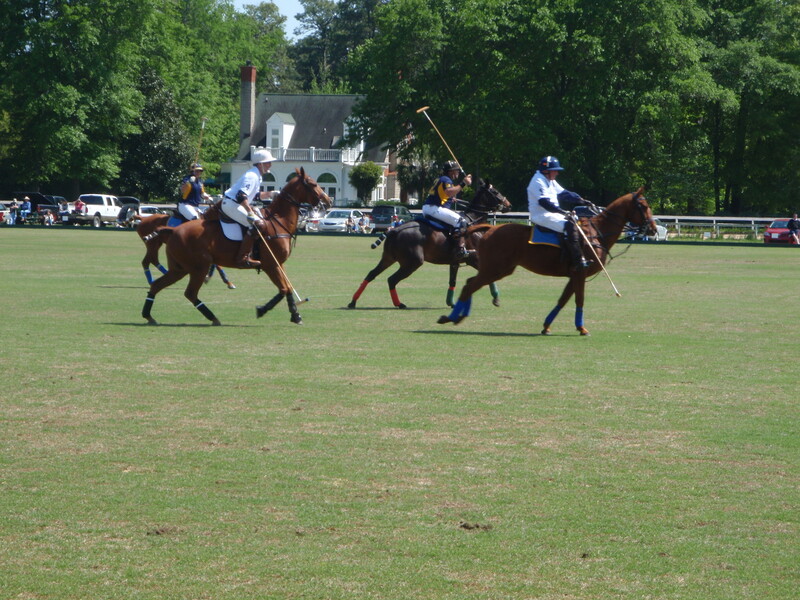 The announcer said this is the oldest continuously-played-on polo field in the country, and they started back in 1882. Since I had just walked in, I found a good place to stand where no one had parked right near the center of the field, and enjoyed watching the first half. 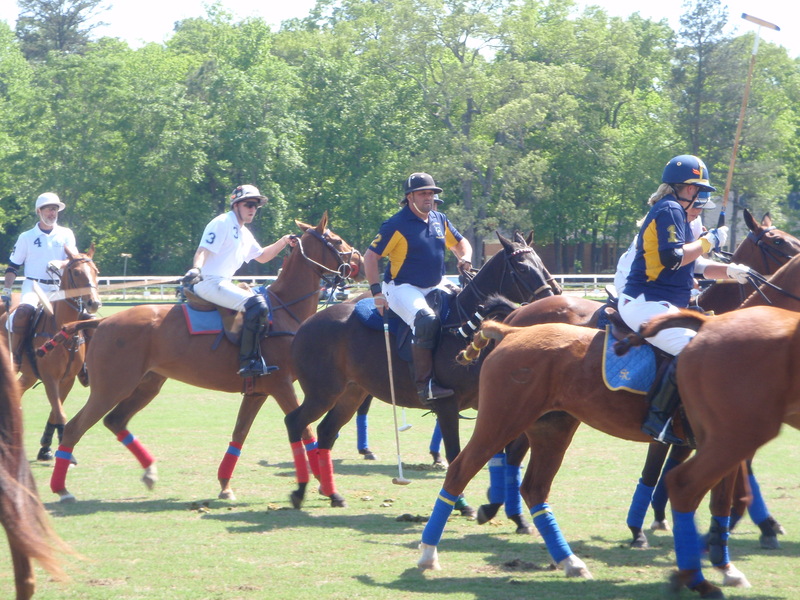 There are 4 people on each polo team, plus a referee, so there’s 9 horses dashing around the field, and the thundering hooves kind of echo. The mallets must be about 4 feet long, and they’re sometimes swung in circles, and sometimes swung outward from the horse, so in addition to all the running horses, you have swinging mallets (and they hit that ball hard! ), and it’s simply hard to believe that horses and people aren’t hit with a mallet! I would think a good thwack from a mallet could break a horse’s leg, but they’re all protectively wrapped, and their tails are wrapped too, so they don’t get tangled up in any of the action. 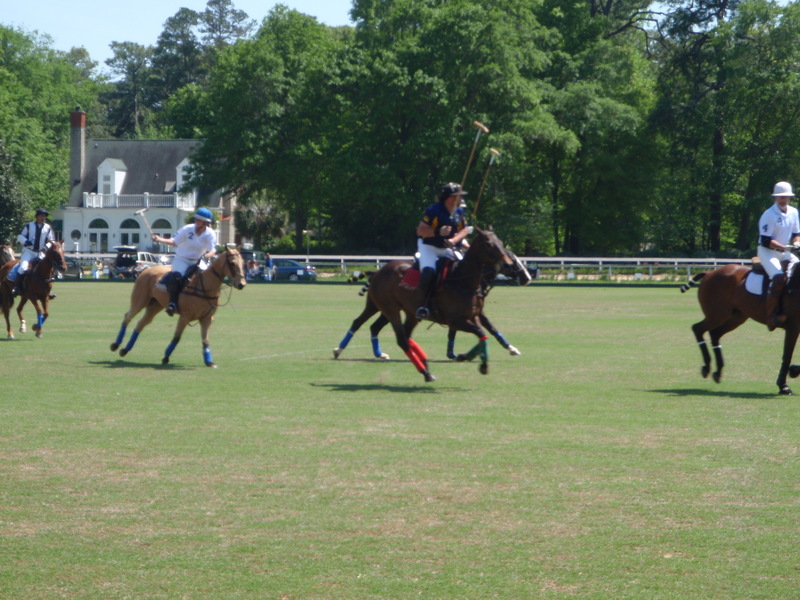 There were 3 chukkers in the period, and each chukker was 7 minutes long, and a horn blows to signify the end of a chukker. The ball has its own “right-of-way” and there seem to be lots of rules to remember. 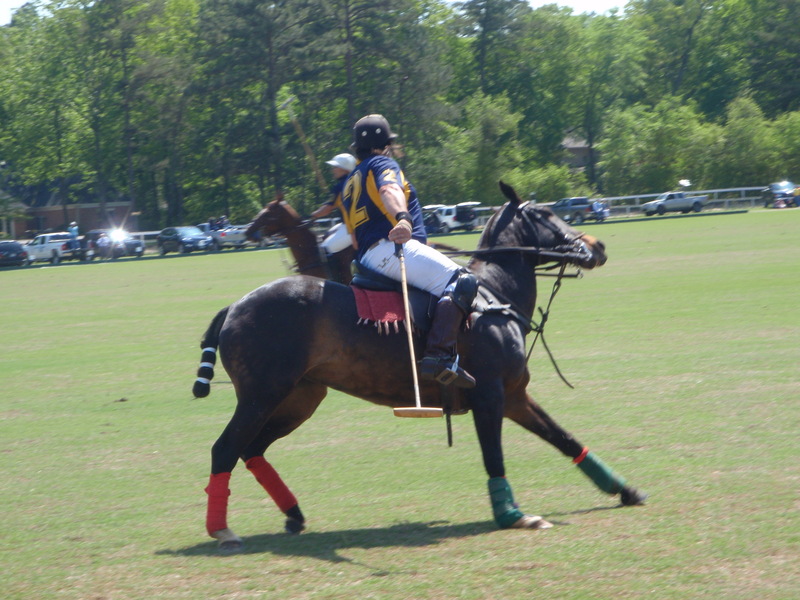 The players and horses could get a few moments of rest during the frequent fouls, which often seemed to have something to do with the ball’s right-of-way. 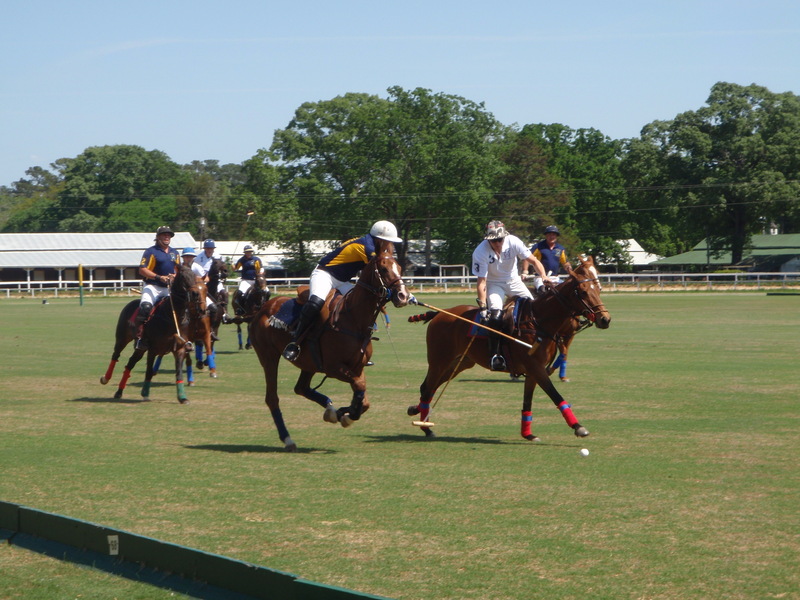 At the end of a chukker, everyone goes and gets a fresh horse, so I’m sure there’s a great deal of strategy involved figuring out when to use each horse, when each player needs 6 of them during the match – one horse isn’t sufficient; a polo player needs a whole string of horses! During the halftime break, the spectators were asked to go out onto the playing field to tamp down the divots that the horse’s hooves had dug out of the ground. 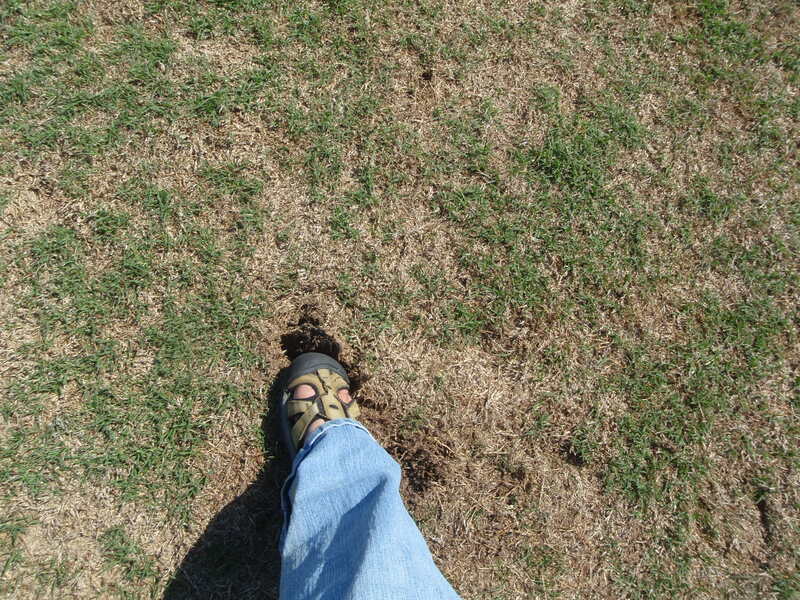 So I walked out with everyone else and pushed sod back into the little holes. 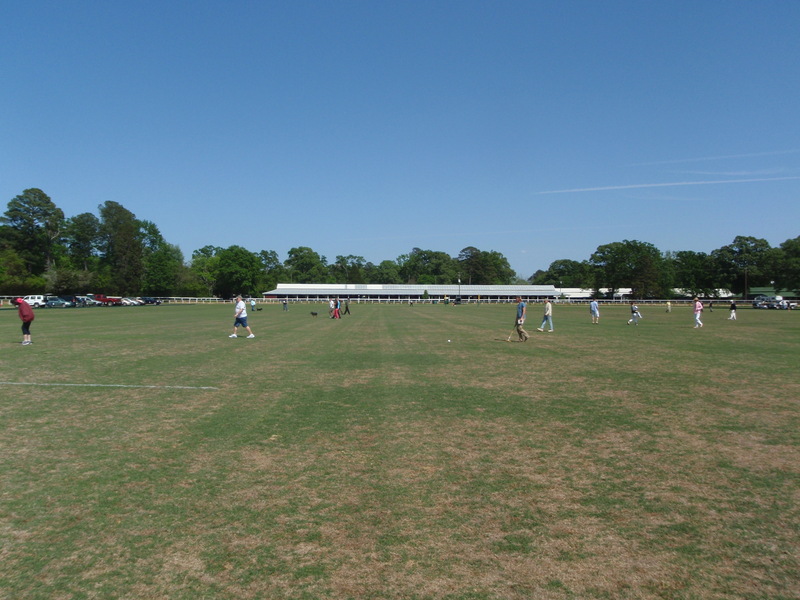 The polo field is really big – I’m not sure what the dimensions are, but certainly bigger than a football field. 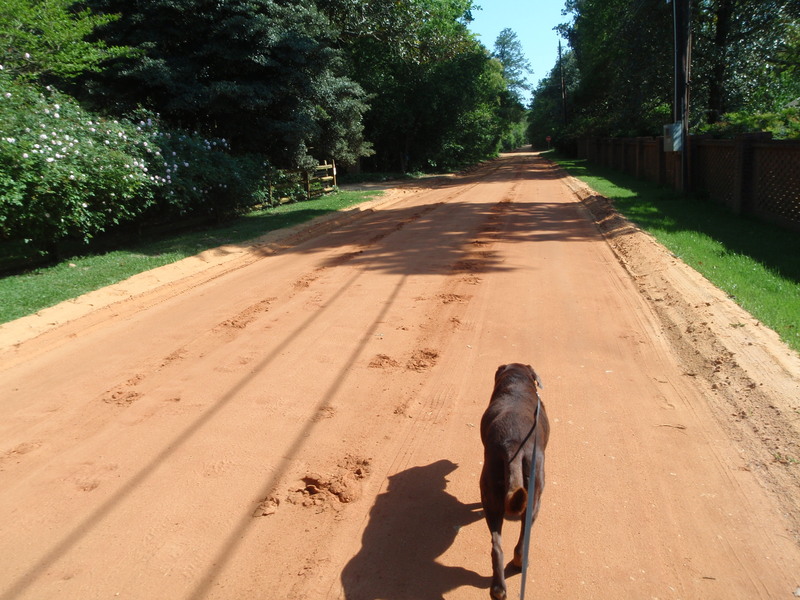 I’d been standing during the whole first half, which was about 50 minutes, and I was ready to move around a bit, so I got Tula out and we walked some more around the dirt lanes. I thought I’d get back in time for the last chukker, but the second half must have gone faster than the first half, because people were already leaving when I got back. But that was fine – I’d seen what I wanted to see! 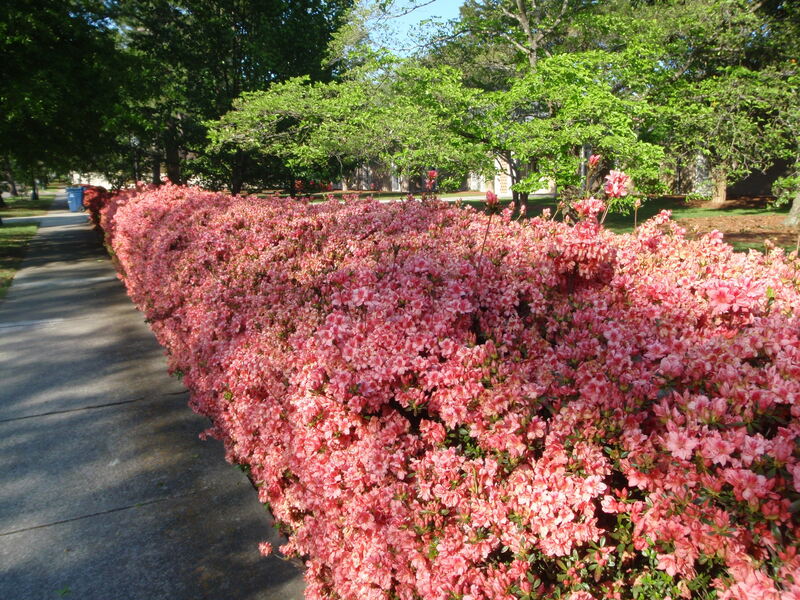 The actual town of Aiken is pretty too – and I finished off my walking for the day there. 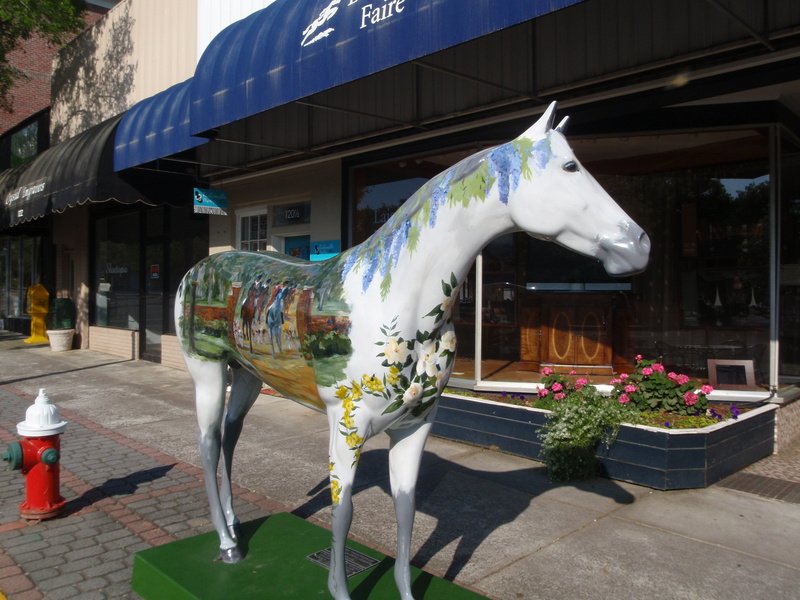 There are numerous horse statues throughout town, and they’re all painted differently. And then I was ready to camp! It had been a beautiful day and it was going to be a pleasant night with no rain, so I looked to see what my options were. The website for Pine Acres Campground just north of town looked nice, so I drive out there, turned in, and immediately came back out! I don’t know what the website was picturing, but this looked like a place where there were permanent shabby trailers, and a sign saying they were also selling repo’d trailers. I couldn’t stay there! 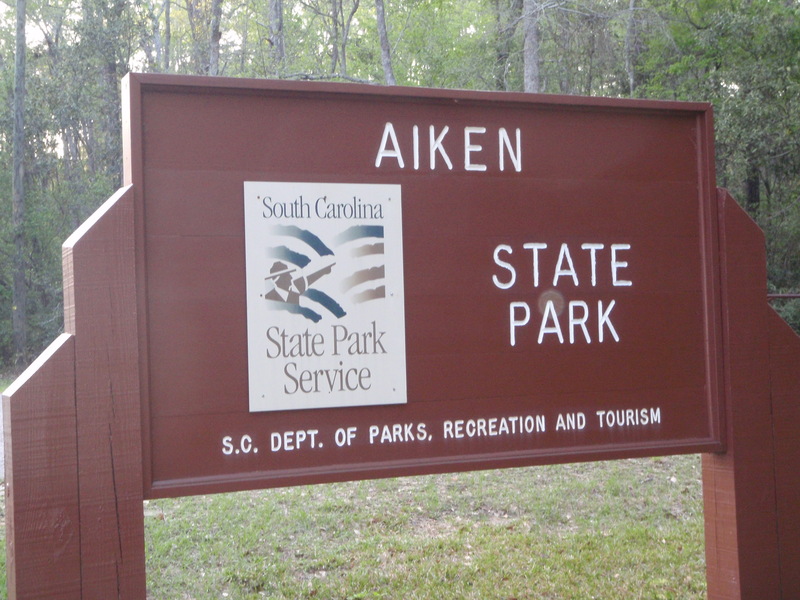 Then I read about Aiken State Park, which was a ways away, but it was a pretty drive, and it turned out to be a beautiful uncrowded campground with lots of pine trees, and I really enjoyed being able to camp again – it had been a long time!